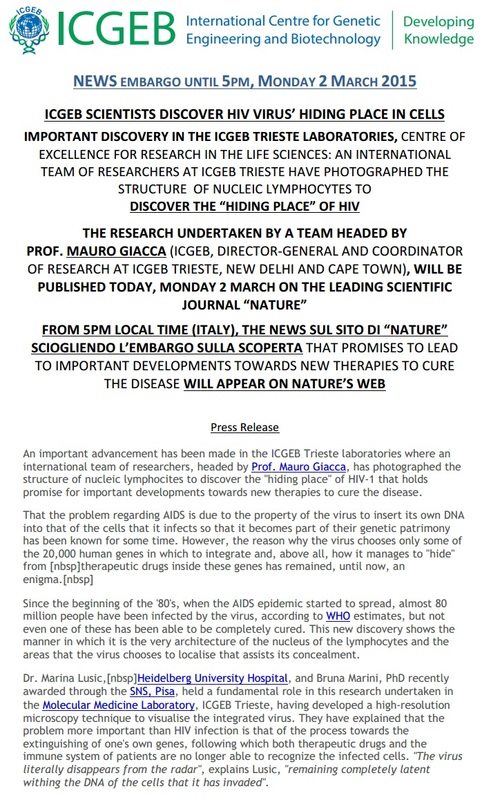 An important advancement has been made in the ICGEB Trieste laboratories where an international team of researchers, headed by Prof. Mauro Giacca, has photographed the structure of nucleic lymphocites to discover the “hiding place” of HIV-1 that holds promise for important developments towards new therapies to cure the disease. That the problem regarding AIDS is due to the property of the virus to insert its own DNA into that of the cells that it infects so that it becomes part of their genetic material has been known for some time. However, the reason why the virus chooses only some of the 20,000 human genes in which to integrate and, above all, how it manages to “hide” from therapeutic drugs inside these genes has remained, until now, an enigma. Since the beginning of the ’80’s, when the AIDS epidemic started to spread, almost 80 million people have been infected by the virus, according to WHO estimates, but not even one of these has been able to be completely cured. This new discovery shows the manner in which it is the very architecture of the nucleus of the lymphocytes and the areas that the virus chooses to localise that assists its concealment. 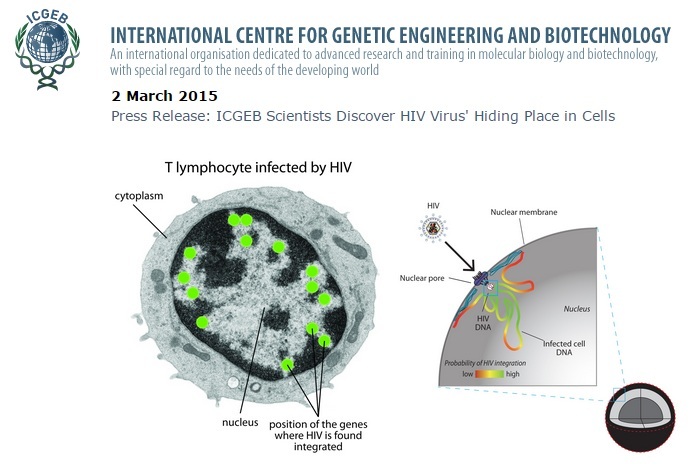 Dr. Marina Lusic, Heidelberg University Hospital, and Bruna Marini, PhD recently awarded through the SNS, Pisa, held a fundamental role in this research undertaken in the Molecular Medicine Laboratory, ICGEB Trieste, having developed a high-resolution microscopy technique to visualise the integrated virus. They have explained that the problem more important than HIV infection is that of the process towards the extinguishing of one’s own genes, following which both therapeutic drugs and the immune system of patients are no longer able to recognize the infected cells. “The virus literally disappears from the radar”, explains Lusic, “remaining completely latent withing the DNA of the cells that it has invaded”. The Board of Governors, made up of representatives from each Member State, the Council of Scientific Advisers, composed of eminent scientists who oversee the scientific excellence of the Centre, and the Management, which is constituted by the Director-General, Prof. Mauro Giacca, Prof. Sudhir Sopory – Interim Director ICGEB New Delhi, Prof. Iqbal Parker – Director ICGEB Cape Town and by the Director Administration and External Relations, Mr. Decio Ripandelli. At present more than 400 people from 38 different countries are working in the ICGEB laboratories as research scientists, postdoctoral fellows, PhD students, research technicians and administrative personnel.